Dr. Saima Mushtaq expansively touches all aspects of cancer larynx at sqadia.com. 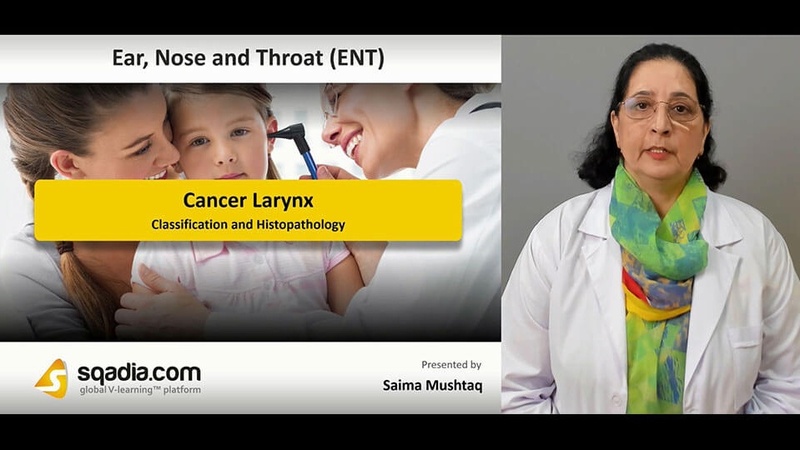 Starting off with classification and histopathology, types of laryngeal cancer also comes under debate which include supraglottic cancer, glottic cancer, and subglottic cancer. Then various diagnostic techniques and treatment strategies are also discussed. Lastly, information about treatment of glottic carcinoma is emphasised. This section is initiated by talking about epidemiology and aetiology. After that TNM classification and staging of cancer larynx is highlighted. Histopathology of 90–95% of laryngeal malignancies are squamous cell carcinoma and shows varied grades of differentiation while remaining 5–10% of lesions are verrucous carcinoma, spindle cell carcinoma, and sarcomas. Supraglottic cancer, glottic cancer, and subglottic cancer are types of laryngeal cancer. Supraglottic Cancer invades adjoining areas such as vallecula, base of tongue. Most frequent sites of glottic cancer is the upper surface of vocal cord in its anterior. Growth of subglottic cancer starts on one side of subglottis. 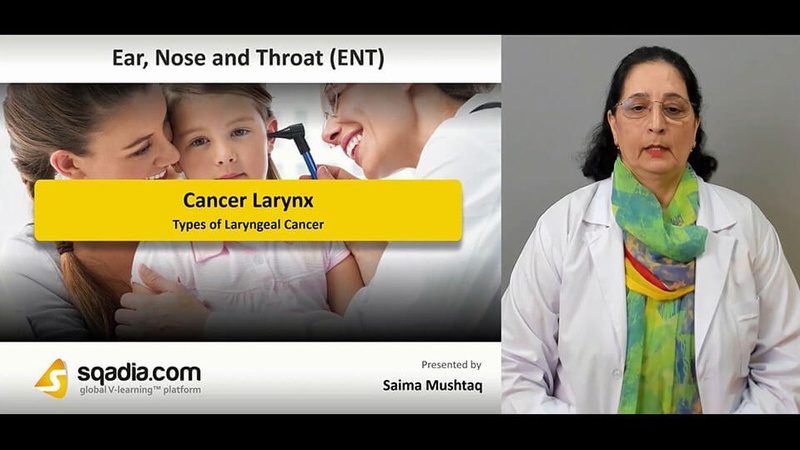 Symptoms of all these types of laryngeal cancer are also enlightened. 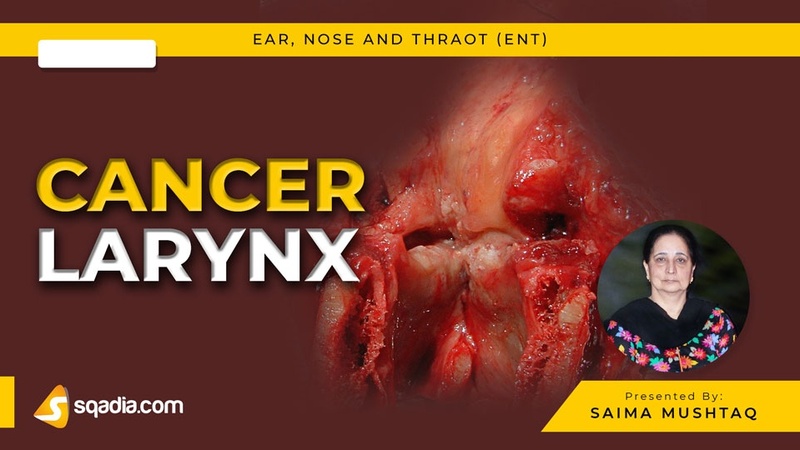 For diagnosis of cancer larynx, it is important to take history of the patient. Some of the diagnostic techniques to be carried out include indirect laryngoscopy, flexible fibreoptic or rigid or video laryngoscopy, examination of neck, radiography, direct laryngoscopy, microlaryngoscopy, supravital staining and biopsy. Medical specialist at sqadia.com, Dr. Saima Mushtaq elaborates all these diagnostic techniques in detail in her medical video lecture. Treatment of cancer larynx depends on site of lesion, extent of lesion, presence or absence of nodal and distant metastases. Treatment strategies to be carried out include radiotherapy for curing early lesions. Next is the surgery-conservation surgery which preserves voice of patient. In total laryngectomy pharyngeal wall is repaired. Furthermore, combined therapy, endoscopic resection with CO2 laser, and organ preservation technique is also used. In the beginning of this section, carcinoma in situ is discussed. This is followed by invasive carcinoma. In depth explanation of T2N0 carcinoma is given with the help of a flow chart. Moreover, treatment of subglottic cancer and supraglottic carcinoma is elucidated. Comments are also given on vocal rehabilitation after total laryngectomy, artificial larynx, and tracheo-oesophageal speech.